Foreign nationals wishing to be legally employed in Singapore need a work visa to be able to do so. 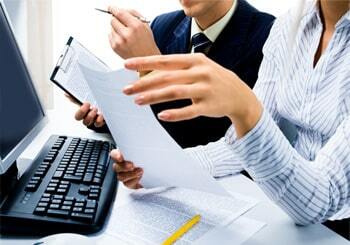 We, at Singapore Company Incorporation, can assist you with our full spectrum of work visa processing services. This includes reviewing the candidacy, acting as a liaison with the Ministry of Manpower (MOM), applying for the work visa, processing renewals, appealing, as well as tracking the application status. Work visas in Singapore range from work permits for domestic workers and labourers, S Pass for mid-level skilled workers, to P-category Employment Passes (EP) for experienced professionals, managerial personnel, executives or specialists with good credentials. Among these, for work permit and S passes, employers have the restrictions of foreign workers levy and foreign workers quota before they can employ foreigners. For EP, there is no such restriction. 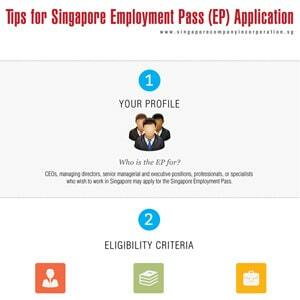 Below we present everything that is to know about the EP application procedure of Singapore. 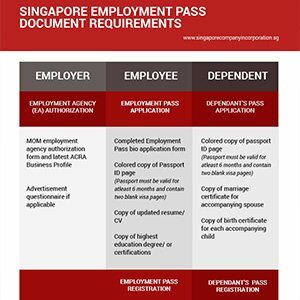 Who can apply for a Singapore Employment Pass? Foreign individuals who have an employment offer from a Singapore employer. In this case, the employer will make the EP application on the individual’s behalf. Every application is evaluated on case-per-case basis by the MOM. Thus, candidates without the qualifications as required by the recently-enhanced EP framework may not necessarily be rejected if they have a proven track record and exceptional skills-set. While young graduates from good institutions can qualify for the EP if they earn at least $3,600 every month (effective 1 January 2017), more experienced candidates need higher salaries to qualify. MOM doesn’t have a list of approved institutions. Rather it evaluates every application on its own merit, based on criteria such as global and country rankings, and enrolment standards. Do note that all employers hiring a foreigner on an Employment Pass (EP) are governed by the Employment of Foreign Manpower Act, which prescribes the responsibilities and obligations pertaining to the employment of foreign workers in Singapore. The MOM encourages extensive use of its Self-Assessment Tool (SAT) to get an indication of whether a candidate meets the EP requirements. 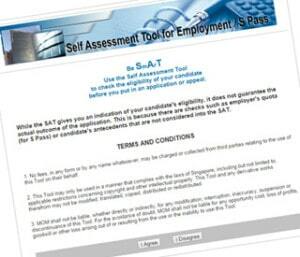 Candidates themselves can also use the tool to assess their eligibility. If SAT is positive, there is a high probability that the EP application will be successful. 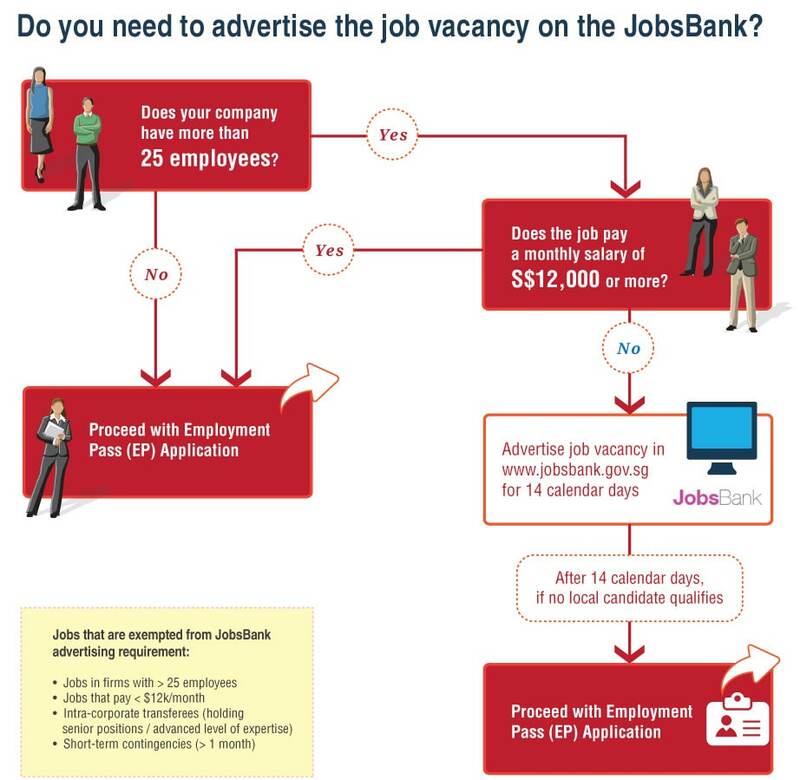 From August 1, 2014, as part of the Fair Consideration Framework, some firms that wish to hire Employment Pass holders must first advertise that position in the Singapore Workforce Development Agency’s Jobs Bank. However, there are certain exceptions. Singapore has consistently ranked as the easiest country in the world for doing business in the World Bank’s Ease of Doing Business index. A major contributing factor in that is the e-service called EP Online. EP Online is a portal for business employers and employment agencies to perform EP and S Pass transactions, which reduces the processing time remarkably as indicated above. An employer or authorised third party can make an EP application. 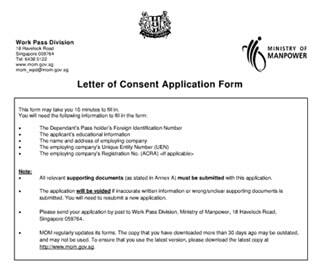 If a candidate is in Singapore on a visit pass that will expire before the Employment Pass is issued, MOM will not be able to extend the visit pass. The candidates must arrive in Singapore only after the EP is approved. An overseas employer with no registered office in Singapore will need to get a Singapore-registered company to act as a local sponsor and apply on its behalf. Only manual submissions of such applications are allowed. If any of the above documents are not in English, an English translation and a copy of the original document is needed. The translation can be done by your embassy, notary public or a credible translation service. Chinese applicants – certificate of graduation and verification proof of these certificates. Note that relevant skills, educational qualifications and professional background matter in securing a Singapore EP. Candidates from tier one countries/region and ones with skill-sets not locally available, generally fare better. It also helps if the candidate’s job scope and job title matches each other, as well as if his or her prospective salary is commensurate with experience and qualifications. If the foreign talent is being hired by a niche industry or by an established company with successful track-record of more than three years, the EP approval rates are high. If the applicant’s skills-set is complimenting the local work-force, rather than competing with it, chances of MOM considering the application positively are substantial. If all the above mentioned is taken care of diligently, there is no reason why your EP application will be rejected. But Singapore Government in a bid to generate a “Singapore core” in the country’s workforce has made the EP process a bit stringent. So, sometimes even worthy candidates get their EP application rejected. Then, it all comes down to the appeal you make against the rejection, an area which we specialise in. In most cases, a rejection advisory is issued for an unsuccessful EP application. Thus, the chance of a successful appeal, which must be made within three months of the rejection, is highly improved if the reasons mentioned in the advisory are taken care of. MOM categorically states that “there will be no change in the outcome, unless there is new information in the appeal”. Also, the rejected candidates are not allowed to appeal. Only the employer or the authorised third party who had submitted the initial application may appeal. MOM normally takes at least three weeks to process an appeal matter. 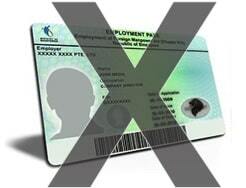 To read more on Employment Pass rejection and appeals, please click here. Unlike a new EP application, renewing an EP is far easier. For those employers or authorised third party with an Online EP account, renewal of their employee’s EP is possible any time under six months of the Pass’ expiry date. The renewal process takes only seven working days, and if successful, the employee on renewed EP is granted permission to work in Singapore for three more years. The employer itself can do it or hire an authorised third party to do it for the company. EP renewals are not guaranteed and all applications are evaluated based on the current eligibility criteria. All applications for EP (sponsorship) holders must be done manually. An EP must be cancelled immediately if the pass holder no longer works for you or goes missing. In case the EP holder becomes a Singapore Permanent Resident (PR), cancellation of EP is not essential. All related family passes (dependant pass and long term visit passes) will also be cancelled. Seek tax clearance from Inland Revenue Authority of Singapore (IRAS) before the pass holder leaves the job. A 30-day short term visit pass (STVP) can be issued to the ex-employee, which allows him or her to stay in Singapore for the said period. The STVP must be submitted to the immigration officer when the ex-employee leaves the country. An EP holder or the employer must notify the MOM of any changes in the company’s name and address, occupation, salary and residential address. EP holders are eligible to apply for permanent residency in Singapore through the Professional, Technical Personnel & Skilled Workers (PTS) scheme. It is advisable to wait for at least six months before making the application so that you can furnish the required proof of six months’ salary. An experienced immigration expert like us can assist with a review of your supporting documents and share some pragmatic tips on improving the chances for a successful Singapore permanent residency application. To learn more about Singapore PR application, click here. EP holders who earn at least S$6,000 per month can get certain family members to join them in Singapore. 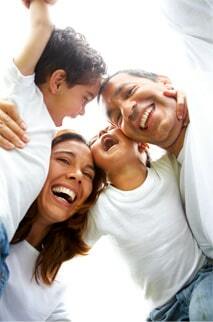 For this, the employer needs to submit a separate application for each family member, which although, can be submitted together with the EP application. As in the case of the EP application, if any of the above documents are not in English, an English translation and a copy of the original document is needed. Family members of EP holders, who have secured a Singapore Dependant’s Pass (DP), can apply to work in Singapore. For this, they can either go for an EP themselves or opt for a Letter of Consent (LOC). For the LOC option, the DP holder, with at least three months pass validity still remaining, must first secure a job offer with a Singapore employer. As in case of the EP, an LOC application has also to be made by the DP holder’s prospective employer. Since the DP, and in turn the LOC, is tied to the main EP holder, both (DP and LOC) are automatically cancelled on the cancellation of the EP. Engage us for immigration, recruitment and work visa services and liaise with a dedicated specialist who will attend to every step of your EP application thoroughly.